Over the last several decades, the average life span of an adult in the western world has increased. More elderly patients with more complex coronary lesions are therefore being treated with percutaneous coronary intervention (PCI) by interventional cardiologists, particularly in high volume PCI centres. Typically such lesions are calcified and frequently may be either non-crossable or non-dilatable with standard angioplasty balloons and techniques. The evidence for treatment of chronic total occlusions (CTO) and achieving full revascularization is more robust in the current era, leading more operators to take on these challenging cases. CTOs occur more commonly in older patients and in those patients who have been previously treated with coronary artery bypass graft (CABG) surgery and are usually associated with at least moderate calcification. Development of the CTO PCI algorithm has seen major advances in techniques to achieve higher overall success rates with utilization of anterograde-dissection re-entry and retrograde approaches. 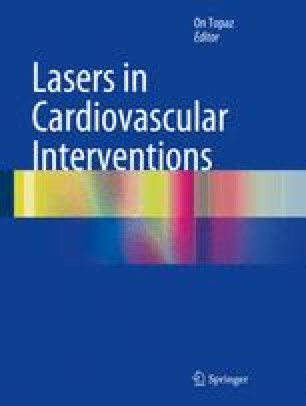 This review examines the role of excimer laser coronary atherectomy (ELCA) as an adjunctive technique during PCI of balloon failure cases and CTOs. ELCA will be examined in the context of the alternative techniques available and the potential utilization will be demonstrated in a number of clinical cases. The expanding experience of ELCA in the treatment of under expanded stents will also be discussed. National population projections 2010-based statistical bulletin. London: Office for National Statistics. 2011. Available from: http://www.ons.gov.uk/ons/dcp171778_235886.pdf.